(No, not the sounds of our house, thankyouverymuch!) Rather, sounds of the actual WILD, as interpreted and helped along by Maurice Pledger and Silver Dolphin Books. If you ever have any desire to just delight the socks off of an animal loving child, you might want to consider the Sounds of the Wild series. 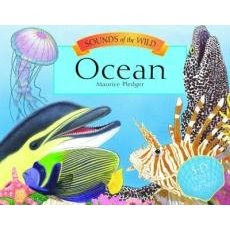 To my sea life lovin' kid, the Ocean book is a true delight. (He was rather beside himself to open up a book and hear the delightful and oh so melodic sounds of a humpback whale singing. As the book aptly labels itself, this is "marine adventure with sounds and pop-ups." Sounds. Pop-ups. Got it? How could you possibly go wrong? At three years old, Bookworm1 seems to have come to the conclusion that in order to preserve books we must be gentle to them. We have momentary memory lapses in this department, but in general he has learned to be kind to our bookish friends. He is particularly gentle with Ocean so I'm gathering he has long term plans for this one. (In fact, I'm having a hard time reviewing it because if I open the book in order to better describe it for you, the sounds of the book will draw him over and this review will be lost! I'm holding my breath while I turn the pages which are fabulously and realistically illustrated by Maurice Pledger who I believe some of you are familiar with but I've only recently been introduced to. All I can tell you about the author is that they really love wildlife. (There is very little to no information whatsoever about Pledger to be found online. If someone has a source - do let me know!) At any rate, this author is well published, having written books about all sorts of creatures. Each book includes lovely full page spreads of illustrations, which set up a scene in which any given creature might live. Every other page includes information about the animals which are illustrated into the scenes. Our favorite page in the Ocean book is the one with the red octopus which is featured on a page which shows dolphins, rays and a variety of fish which live in the Caribbean. Turn the page and you can learn more about Caribbean Waters and Creatures of the Reef. 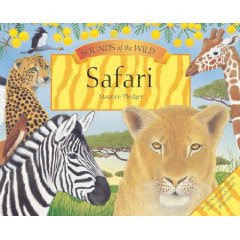 Another of our favorite animals is the elephant so I knew Bookworm1 would get a kick out of Safari edition of this series. The book didn't fail to meet its mark and I'm one super cool mommy, let me tell you! ha! The book begins, "Dawn breaks over the vast African plains of the Masai Mara in Kenya. The sprinting, scampering hooves of an antelope can be heard as it tries to avoid the clutches of a hungry cheetah who is hot on its heels, darting like a flash through the grasses. As the elegant cat closes the gap, drawing ever nearer to its prey, the trumpeting sound of an elephant echoes across the open landscape." Music that suits the feel and sound of Africa welcomes you in as an elephant trumpets in your ear (and Bookworm1 appears at your side to see what you are doing here at the computer with his book...) Wildebeest stomp through water and roar with lions as you turn the pages, alternatively seeing new and exciting animals and learning about the Mara River. These books really are a feast to the eyes and the ears. And if you find yourself not really caring for them (I find this hard to believe) perhaps you can resort to using them in place of a dinner bell. The appearance of Bookworm1 is quite predictable upon opening the covers. 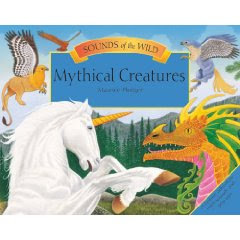 Some new titles in this series have recently been released and I know that one friend in particular might be interested to know that Maurice Pledger has apparently even been able to identify the sounds that Mythical Creatures would make. I'm curious to know myself! Sounds of the Wild is definitely a fun series and a nice surprise and treat for the little ones in particular. Some adult supervision required for little hands but it's not supervision one minds very much. The books are entertaining enough for all ages. Thanks, Silver Dolphin, for letting us check these titles out! And the Travel Bingo was great fun although I had to help the 4 year old who thought that he just had to recognize the pictures on the paper to circle and shout BINGO!